Piso Fare Promos: After we celebrate the National Heroes day here in the Philippines, we are so glad that Air Asia Philippines has recently released their very affordable plane fare to some select destinations. 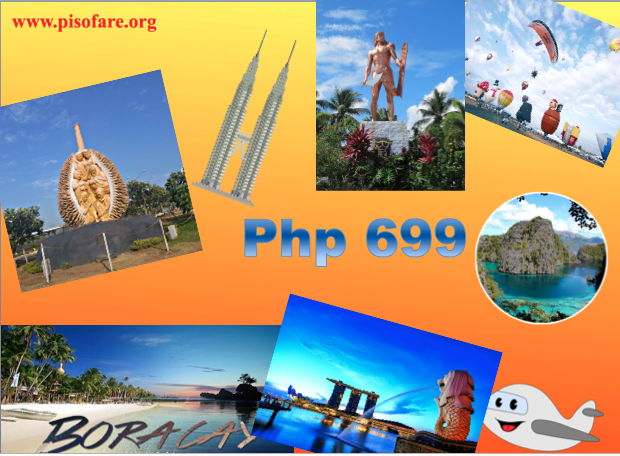 The lowest fare one can book is P699 bound to Kalibo (Boracay) from Clark (Pampanga). However, there are other cheaper promo fares for both local and international routes that plane passengers can avail as well. Though up to this time, no piso fare promo yet is available online. We highly suggest that frequent travelers to avail of such cheaper fares. Hail to this low cost airline, Air Asia Philippines for giving us a very low fare to book and avail. You can do advance booking of plane tickets since the travel period extends to February next year! How cool is that? Read more below. If you plan to visit China or at least visit one of its cities in Guangzhou, then you can take advantage of this plane fare that is below P2k for a one way ticket fare. China is a place where everything seems to be really cheap. And a lot of commercial people happens to do wholesale purchases in this part of the globe. ASC Ref No: A081P082317A Rates are exclusive of Domestic Passenger Service Charge, Web Admin Fee/Booking Processing Fee and Country Specific Charges/taxes. Do keep an eye always on this blog as we might post possible piso fare promos for next year's travel. We wish that another Piso Sale will happen before the year ends. At least in the last quarter of the year. Keep your fingers crossed as well.